Hello my friends! Spring has sprung and Summer is sneaking up on us here in San Diego! The breezes are getting warmer and the sunsets later, the temperatures are creeping up and I can just taste that first sunburn followed by ice cream! 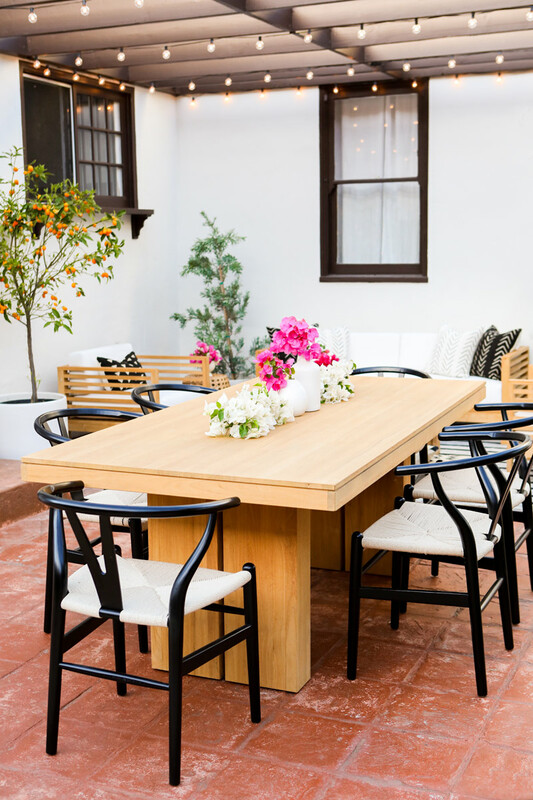 All of that has me dreaming about backyard bbq’s, dining under cafe lights and enjoying long leisurely chats in the backyard while the sun goes down. Ahhhh, Summer living! It’s my favorite. Unfortunately in the two years since we moved in we hadn’t gotten it together to put together an outdoor entertaining space, although as you can imagine I’d mentally decorated it a million times over. We had a table that we’d drag our chairs from the dining room out to for entertaining. And that was about the extent of it. Coming from this backyard in Palm Springs, it was a sad contrast. But now! BUT NOW!!!!!!!!! 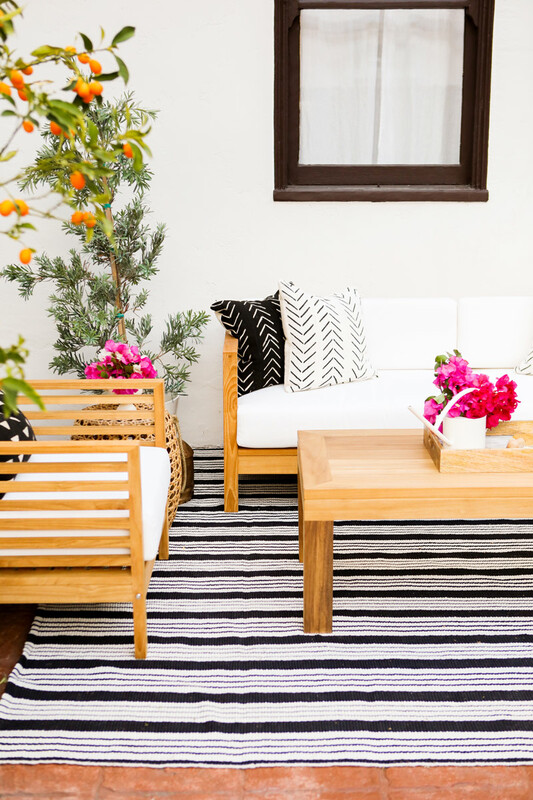 Feast your eyes on this charming little outdoor living space! 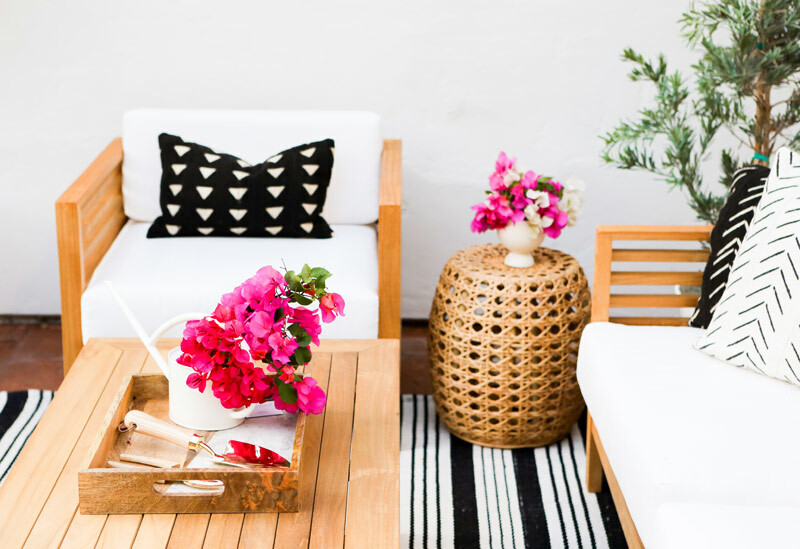 It’s my backyard dream come true: modern teak furniture with crisp white cushions and graphic accents. Bursts of color via fresh cut bougainvillea (my go-to for backyard florals because it’s so abundant ’round these parts…. and also: FREE!!) Potted plants to give it all life. And the chairs. The iconic wishbone chairs that I’ve lusted after for a decade. Sure, they’re indoor chairs and we will have to bring them out from our studio when it’s time to entertain and tuck them away when we’re done. But that’s a price I’m willing to pay because I LOVE them and I couldn’t find outdoor chairs I loved as much. Sometimes the impractical heart just wants what it wants. Indoor chairs outdoors. Reason be damned. As I mentioned above, this space started with a dining room table. 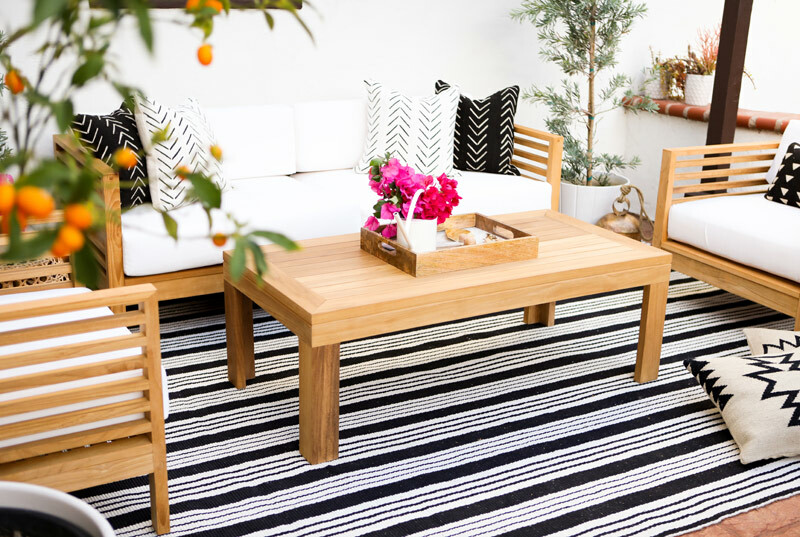 I’m not usually one for matchy-matchy but I did want the dining space and living space to feel cohesive, so I scoured Wayfair for teak pieces that would stand alone but also work seamlessly with the dining table (these were obvious winners for me). 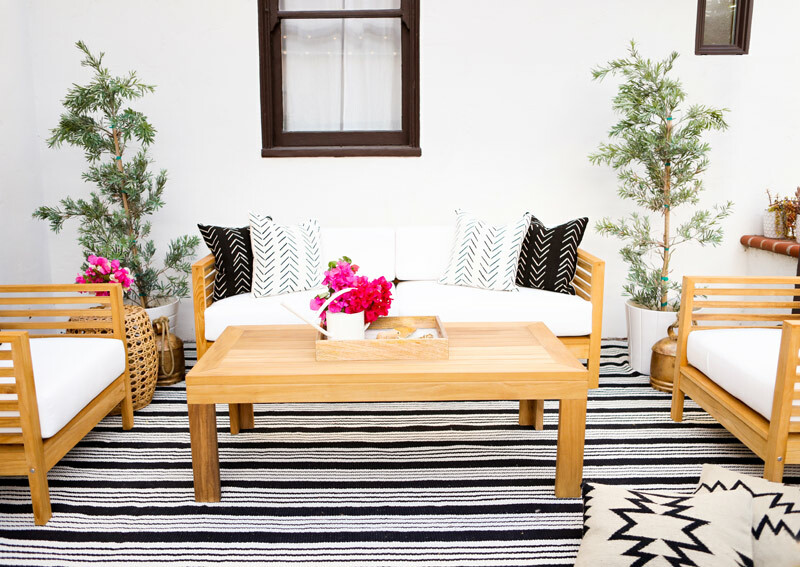 To ensure that the living/dining areas felt like separate spaces,and bring some pattern into the mix, I picked out this rug. My favorite thing about it, besides for how graphic it is, is that it doesn’t feel like at outdoor rug. It’s amazingly soft and high quality. Perfect for backyard bare feet! You know when you fall in love with something online and then it arrives and you realize you didn’t read the description well enough and instead of being a small little something it’s a big little something? Yeah. That’s what happened with these gold bells. I thought they were going to be tiny and I would hang them somewhere. They’re not tiny and if I hung one someone might end up with a concussion after knocking into them. Ooof! BUT, I love them large and they become a part of the decor just as well on the ground! Happy accidents are the best. 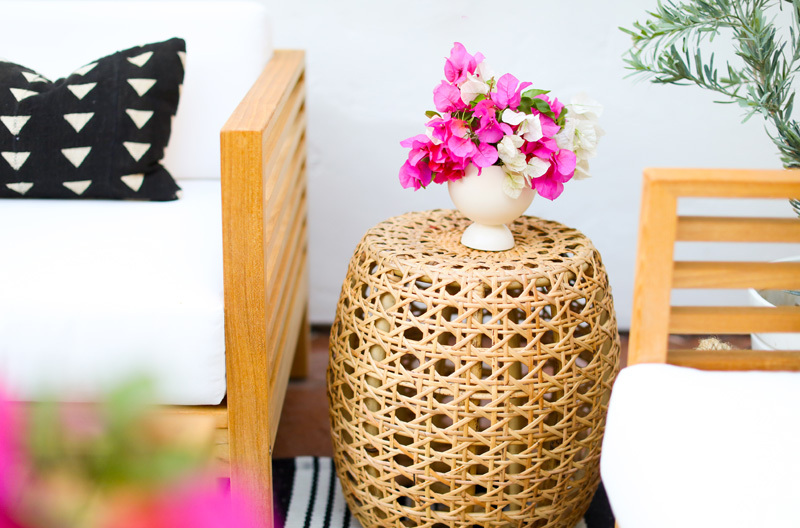 To break up the teak party a little bit I added in this rattan side table. I appreciate the bit of texture amongst all of the lines! 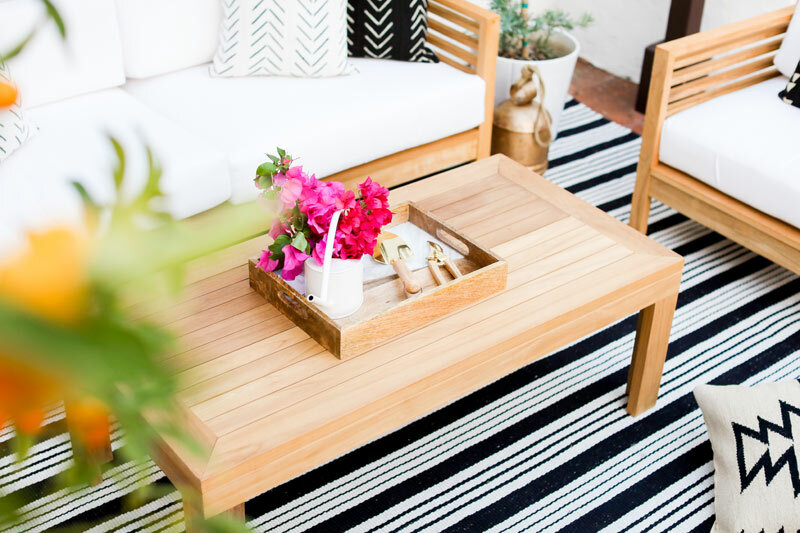 Styling an outdoor coffee table is an interesting thing, isn’t it? I’m not gonna put books on it, and I’m not much of a lantern gal. I don’t know, what are people putting on coffee tables outside these days? 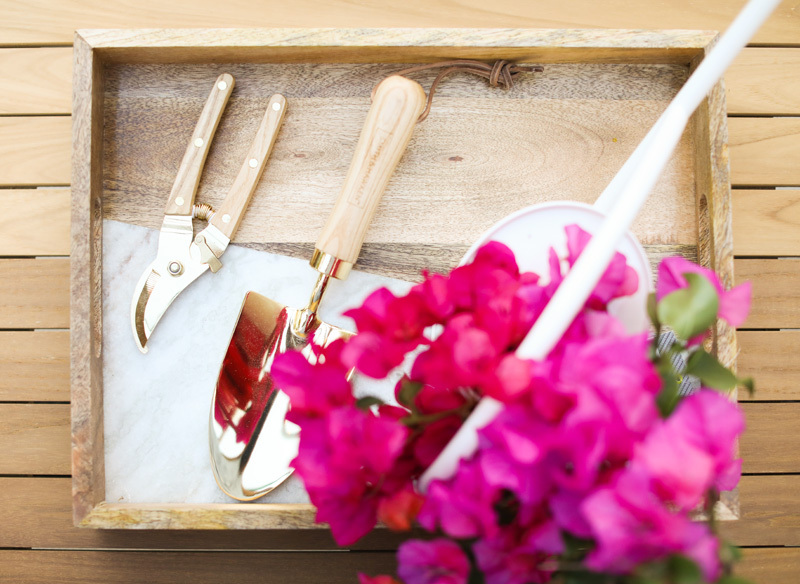 I was at a loss until I found these pretty /useful items: gardening tools and a watering can. They’re lovely to look at, practical and make sense, right? Quite pleased with myself over that one, I must admit! I really like your blog, love all the photos have taken by you! Thank you! Beautiful! I always enjoy your posts. i would love to see how you are making your house baby-friendly as I’m finding it a challenge to create a stylish yet baby-friendly house for my 8 month old. Really beautiful, Sara. Are your cushions the ones that came with the furniture? 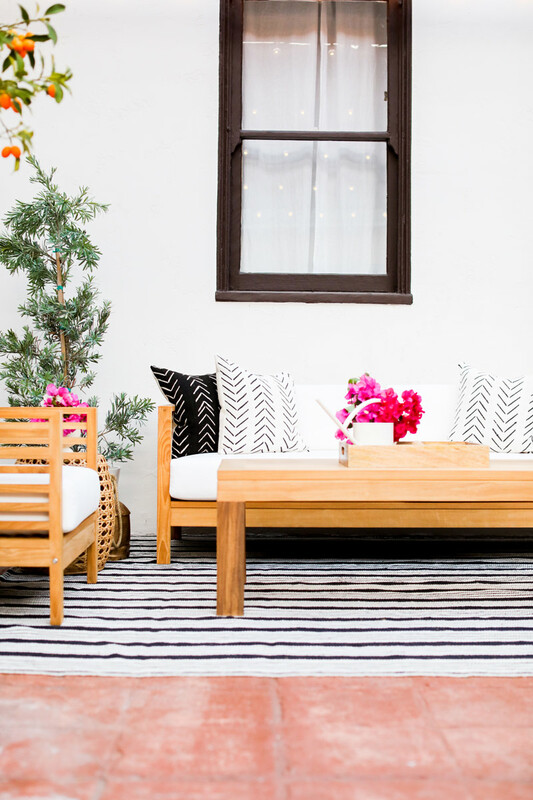 They look so white on your patio and the listing at Wayfair says they are white but look really creamy off-white in their photos. 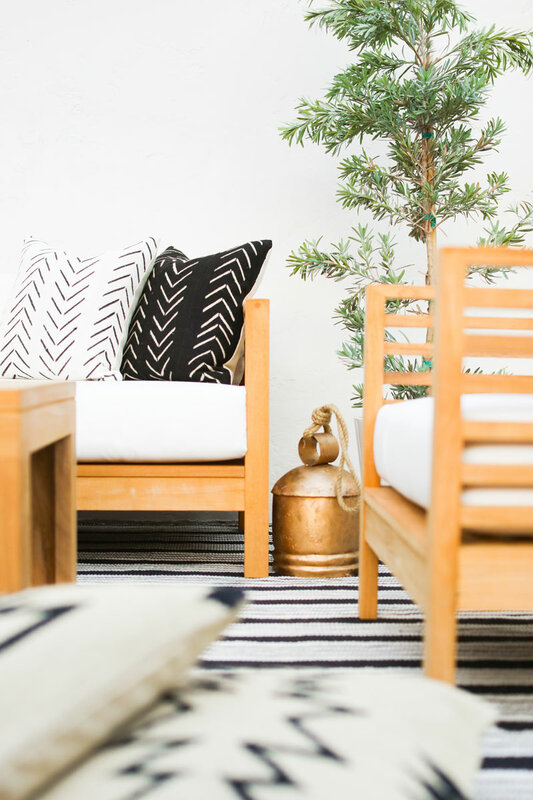 Love the black and white with teak. So chic! Simplicity is unbeatable! All the best. 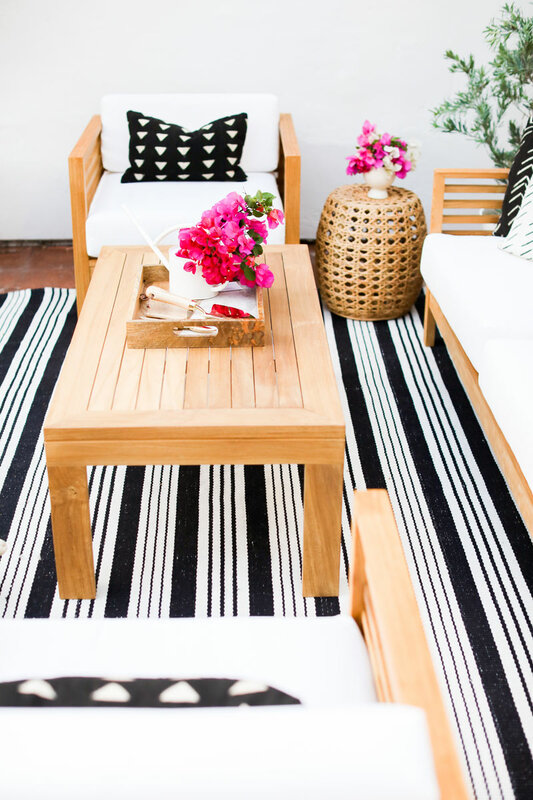 I love the pop of pink in this black and white patio. 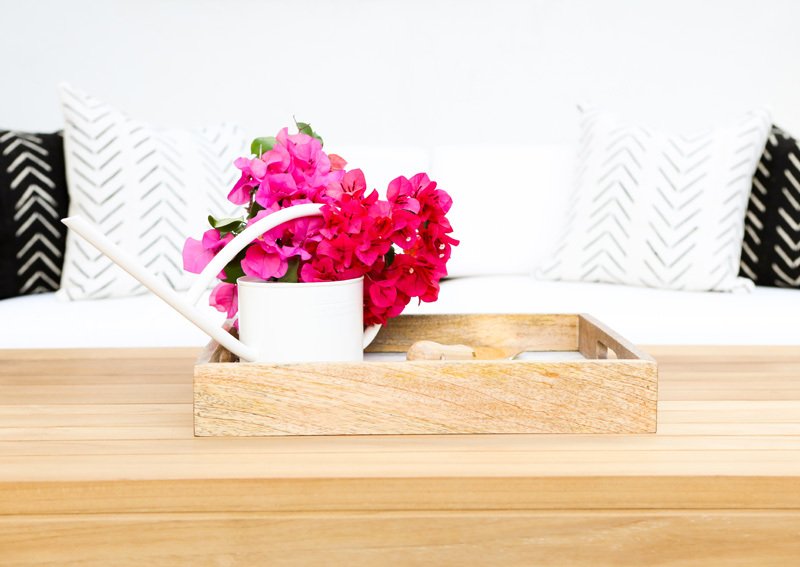 The wood brings the perfect amount of warmth to the space! Lovely, well done!